Translation: Ordnance Survey and Google Maps side-by-side for planning the Land's End-John O'Groats walk in the United Kingdom. My friend Steve is walking the LEJOG in 2010 (I guess that makes him a LEJOGger - as opposed to the JOGLErs who go North to South). Of course he is blogging about it - doesn't everybody?. Even better, he's planning his route using Where's The Path, which is a fantastic side-by-side map site for the U.K. It shows Ordnance Survey topographic maps and Google Maps imagery in a cleverly linked view (similar to the VExGM web site I blogged about earlier this year, but even more useful). Here's a link to the most famous location in Britain (but I suspect it doesn't feature in many LEJOG itineraries, unless you're a real anorak for walking). WTP also lets you digitize paths and export them to GPX and KML. Steve is finding the KML export particularly useful, since it allows him to locate all the pubs along the route of his walk. Now, when is someone going to do this for Canada? All those prospective SJV'ers out there would be overjoyed! Earn a diploma with JTS! The Kungliga Tekniska högskolan in Sweden (isn't Unicode wonderful?) is offering a course on GIS Architecture. I was happy to see that they're using JTS as a tool for exploring the DE-9IM spatial relationship model, and also as an example of a Open Source geospatial library. a section of references to papers about topics in Computational Geometry which are relevant to JTS. The resources have been factored out onto this page. Over the years of working with JTS I've read a ton of interesting and sometimes even useful academic papers about aspects of Computational Geometry. I hope to start documenting these on this page, perhaps with some (no doubt opinionated) comments about applicability. A treasure trove for Geometry geeks! Super Zoom Control is really super! 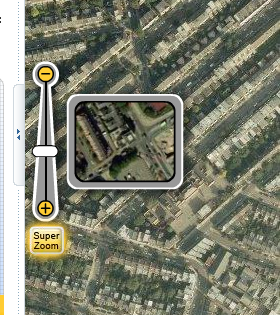 The web mapping site 192.com has a very nice map zoom control which dynamically displays a representative image of the map at the prospective zoom level. This nicely addresses a problem which has occurred in a few applications I've been involved with recently - how to communicate to the user what a given zoom level actually looks like. At first I thought the control might be truly dynamic - i.e. 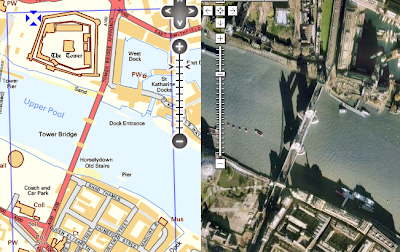 pulling a live tile from the centre point of the current map view. But it's actually just a set of tile snippets at a fixed point. Still, it provides a very nice effect. (The dynamic version would be simple to implement, but perhaps would be too slow in actual use, with unpredicatable latency). Here's a nifty web page which shows a way of visualizing the operation of various common sorting algorithms. The coolest thing about this of course is the ability to dynamically generate rich graphics in the browser. All hail the HTML5 <canvas> element! You can be the first to write the Wikipedia article! Here's a nifty page which shows GM and VE side-by-side, with slaved navigation. It's quite handy for seeing differences in map rendering and imagery. For my area of interest (Victoria B.C.) my 20-second appraisal is that they both have aspects of their rendering which are better than the other; and VE's imagery coverage is more limited than GM's (probably due to this deal). I just saw this blog post in rebuttal to Martin Fowler's DatabaseThaw article. It's a typically well-thought out response from Typical Programmer. The short summary is that he rejects Fowler's criticism of using RDB's as the mechanism for application integration. (And don't dismiss him as simply a RDB bigot - he's not shy about nailing relational gurus, as in Relational Database Experts Jump The MapReduce Shark). TP's arguments ring true to me, although in my experience it takes a very concientious DB shop to fully maintain the "encapsulation of data and operations" across many applications, many custodians, and many developers. It would be great if Fowler's vision of the integration point being HTTP rather than SQL solved all our problems. Loose coupling is a wonderful thing to have. But so far I'm not seeing how this provides equivalent performance for all cases, and how it avoids the problem of data model mismatch. Is Global Database Warming happening? Martin Fowler has a great blikiTM post on DatabaseThaw. The soundbite is something like "What happens after relational DBs?". He has some interesting links to things like Drizzle. This makes sense, but I think they also have offered the benefit of providing a fairly powerful, standard way of modelling and querying data. Over the lifetime of this technology this has fought off some powerful challengers, notably object-oriented data modelling. (Although perhaps this battle was only won by becoming more like the "loser"). 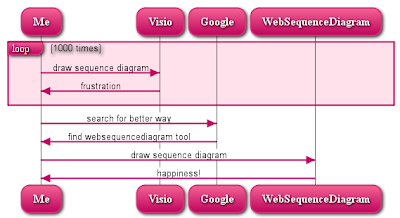 The latest challenger is semantic data modelling (RDF, SPARQL, etc). Perhaps the world is ready to make this transition - although I'm not rushing to sell my Oracle stock. He also makes a good point that the focus of integration is shifting from the DB to the Web. Hard to argue with this... the clouds are moving in! So fine, some unit tests are needed. This should be easy, right? 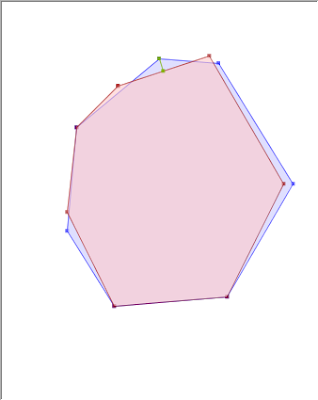 Just create or obtain some polygonal datasets, union them using both CascadedPolygonUnion (fast) and Geometry.union (slow), and compare the results. But there's a catch (in geometric processing there usually is). 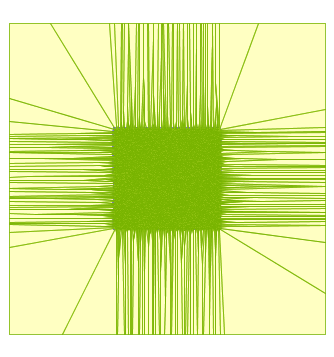 Due to rounding effects, there's no guarantee that the results of the two algorithms will be vertex-by-vertex identical. Of course, they should be very, very similar... but how to check this? 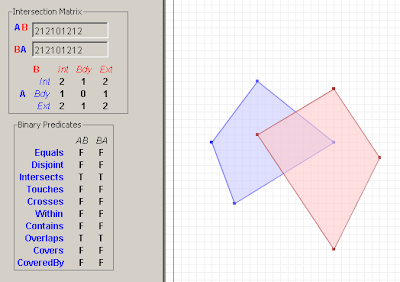 In geometry processing it's usually much harder to test "similar" than it is to test "exact", and this case is no exception. In fact, there's many different tests that could be used, depending on how you want to define "similar". In the context of unit tests, similarity testing is essentially checking for discrepancies which might be introduced into a theoretically correct result. So the tests to use may depend on the operation(s) that are being performed, since different kinds of algorithms can produce different kinds of discrepancies. A further issue which needs to be considered is to detect gross differences which might result from catastrophic algorithm failure. 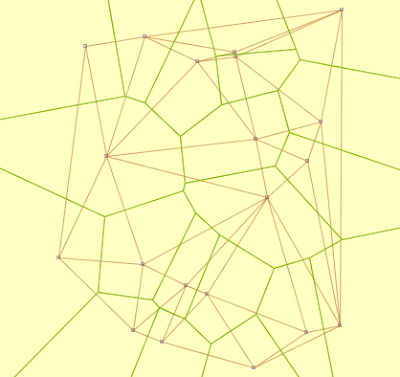 A more robust test is to compute the Hausdorff distance between the rings of the polygons. This allows expressing the tolerance in terms of distance, which is more intuitive. It's also fairly robust and easy to confirm the answer. There's a challenge in developing an efficient Hausdorff algorithm - but that's a topic for another blog post. Other tests might include comparing structural things like comparing the number of rings in the polygons. With this validator written and some test datasets run I can finally confirm that CascadedPolygonUnion actually works! The package is available on SourceForge here. Improved performance for buffering via better offset curve generation and simplification. 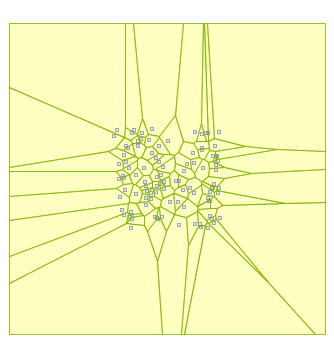 Fixed Geometry.getClassSortIndex() to lazily initialize the sorted class list. This fixes a threading bug.